She was called “one of the most noted women in the country” and “the most famous woman in New Jersey”…yet today few people even know her name! On December 12, 1881, people in New York City would have witnessed a strange sight. High above the East River, a line of men in business suits were cautiously walking along a narrow path of wooden boards laid down across the open steel frame of a huge unfinished bridge. Strangest of all, the line was led by a woman, her long skirt billowing in the wind as she showed them details of the construction. When they reached the New York side, everyone toasted her with champagne. It was the first official crossing of what would be called the Brooklyn Bridge. Many books and films have featured the Brooklyn Bridge and millions of people have crossed it. Built between 1869 and 1883, without modern machines or even electric light, it was the one of the most amazing technological achievements of its time. Yet few people know that a woman helped supervise much of its construction. Hear her tell her story. Carol Simon Levin is a Youth Services Librarian at the Bridgewater Branch of the Somerset County Library. She is an experienced storyteller and a member of the New Jersey Storyteller’s Network http://njstorynet.org/wpnjstory/carol-simon-levin and the Society of Children’s Books Writers and Illustrators. She has always been fascinated by the history of technology and women’s history and is currently writing a book on Emily Warren Roebling. 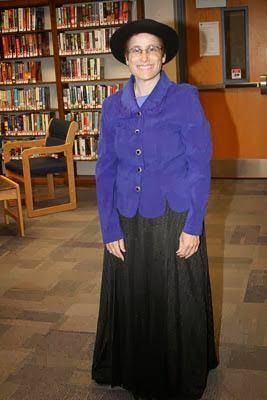 She is happy to bring Emily Roebling to libraries, senior centers, historical societies, schools and other venues. The presentation includes a “lantern slide show” (PowerPoint presentation) and will be made in costume impersonating Emily Roebling or in street clothes as a straight lecture if preferred. If interested, please contact Carol Levin at: cslevin59 @ gmail (dot) com, 908 781-6041. The program can be tailored for children, teen, or adult audiences. What people are saying about Emily…. “Knowledge of subject is told with great enthusiasm! Learned a lot! –J.P. “Excellent Presentation! Thanks! !” — N.C.
“Thanks so much for coming to NJDOT and informing us about our transportation/bridge building legacy. Especially enjoy amount of illustrations, good detail and very nice presentation.” — L.R. “Excellent presentation with lots of details. Very well presented.” –N.G. “Excellent presentation and very informative. She set the stage for all of us. I was fortunate to run over the bridge a few times during the NYC marathon.”– M.F. If your venue is interested in previewing “Emily” prior to a performance, please contact me for a private YouTube link. Video Preview of Bridge Builder in Petticoats now available.